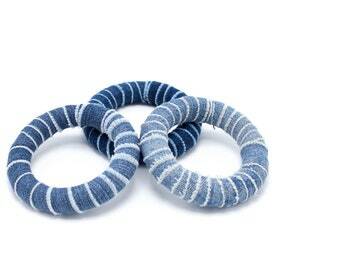 Denim accessories that are fashionable and affordable! A Touch of Denim ladies’ accessories was born from my love of denim and its versatility. I love the various shades and washes of denim, including the frayed look! 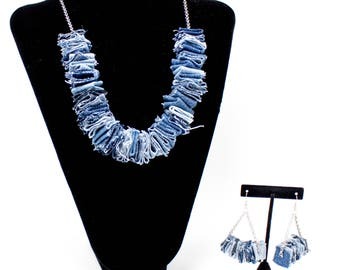 Every piece of jewelry I create features denim as a key material. Some of the pieces are repurposed from thick denim trim and feature the characteristic double lines of stitching. Other pieces are fashioned from swatches of denim and have intentionally frayed edges. Each piece of denim is treated to help it maintain a beautiful, bright appearance and prevent any future fraying. Many of my designs feature Swarovski crystals, unique pendants, and eye-catching gold and silver toned chains and fastenings. Others are almost entirely crafted from denim. Denim is incredibly versatile, and I love creating designs that reflect it’s versatility. From elegant, to edgy, to bohemian—denim can handle it all! A Touch of Denim accessories are great for occasions that aren’t too dressy, but still call for a little something special—casual Fridays at work, a girls’ night out, brunch, a dinner date, or even a backyard BBQ. It’s all about how you wear it. I believe that fashion should be affordable. I’m committed to creating quality jewelry at a fair price, so everyone can experience these one of a kind pieces! Each accessory is crafted entirely by hand and has a unique design. Whether you are interested in purchasing a single jewelry piece, placing a wholesale order, or having something special custom designed for you—my goal is to help you find exactly what you are looking for. Glam up your casual by wearing “A Touch of Denim” accessories. Your style just got a whole lot more fashionable! I love this collar necklace! It lays nicely around my neck and is a very comfortable fit. The first day that I wore it I received lots of compliments. 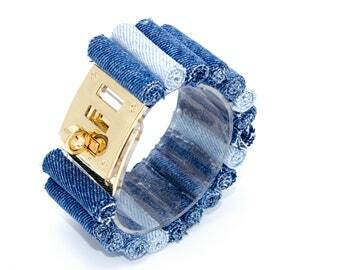 I love A Touch of Denim accessories, quality accessories at an affordable price. Hi, I’m Shelia! In my life I’ve worn many hats, but none of them fit as well as wearing the hat of an artist and entrepreneur. I am very creative and have always loved designing unique and different things. I love denim and it’s versatility. 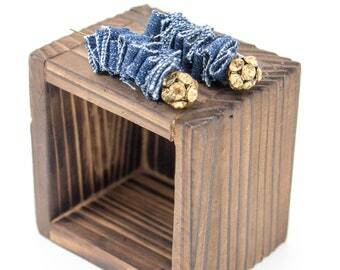 A pair of old denim blue jeans can be re-purposed to anything that you can imagine. Denim is commonly used not only in clothing, but in purses, interior design, footwear and even furniture upholstery! Why not jewelry too? With this thought in mind, I decided to design my own line of denim jewelry and accessories. One day, I purchased a sewing machine, fabric, and jewelry findings. I began designing and creating, and a few months later A Touch of Denim was born. I design accessories that are trendy, fashionable and affordable enough for anyone. Everyone has a different sense of fashion, and I believe in embracing your personal style. Whether you’re looking for something bohemian, haute couture, casual, or just pretty and feminine—my goal is to create a wide array of one of a kind styles that will suit any taste. To me, denim is just like black—it will never go out of style! Hi, I’m Shelia! I am very creative and have always loved designing unique and different things. I love denim and it’s versatility. A pair of old denim blue jeans can be re-purposed to anything that you can imagine. Why not jewelry too?